The biggest hubbub over the past week regarding my CSA has been the purple peppers. Before this week, they were one of the bells peppers that I had not tried yet. I’m a huge fan of yellow and orange peppers, as well as red ones. In my trips to the grocery store, I’ve always been very intrigued by the purple peppers, but just never got around to trying them. Naturally, when these appeared in my CSA box, I was thrilled. 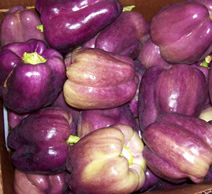 They’re very pretty (pretty purple peppers…love the alliteration! ), a purple/whitish exterior with pale green insides. A friend of mine mentioned that she thought they tasted a lot like green peppers (“a little too much like green for me” was the actual quote), and I wholeheartedly agree with her! I was hoping that these would be on the sweeter side, like the yellow, orange, and red peppers that I absolutely adore this time of year. However, these are on the bitter side – but not as bitter as green peppers, which I’m not a fan of. My husband enjoyed them, and thought that they’d taste great in an omelette, too. I did end up liking them, but not as much as I do of the other, sweeter varieties. For those of you that enjoy my recipe posts, fear not – I have quite a few that are backlogged due to my being at band camp this week, where I need to devote my time to writing halftime show moves rather than recipes. We also received our CSA today, which is chock-full of some great vegetables, as usual. Once I get through this week, my writing will pick back up!